Podcasts have completely changed driving for me personally, and my family as a whole. I no longer dread my morning commute, or find myself facing whiny kids before long car rides. Now we all get excited to use our drive time to enjoy favorite podcasts and discover new ones. 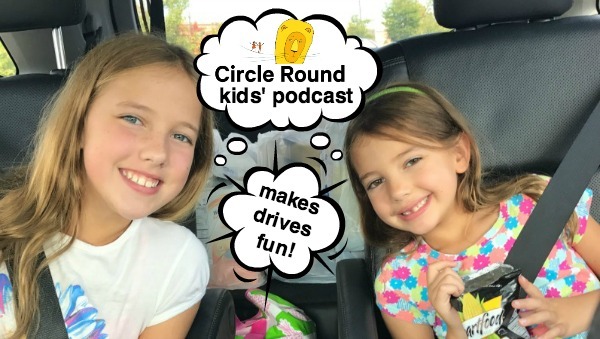 We are enraptured with a new podcast for kids, Circle Round. It is a storytelling podcast featuring folktales from around the world, all with an unifying theme of inclusivity. Jason Alexander (forever known as George in our hearts) performs the first tale in the Circle Round series, the classic Yiddish folk tale It Can Always Get Worse. A Romanian fable, Stella & The Dragon, is the second episode and it is voice acted by one of my favorite actresses, Kathryn Hahn. New episodes will air Tuesdays at 3pm and will include stories from The Phillippines, Nigeria and more regions, and voices you might recognize are Lou Diamond Phillips, Jon Cryer and Dayo Okeniyi. When you listen to the stories as a family — whether during drives or as your end of the day bedtime story — you feel like you are attending a children’s theatre performance. The sound quality, voice acting and most of all, the morals of kindness and generosity, resonate with all ages. Sure, Circle Round is aimed at kids age 3 to 10, but the 13 year old and forty-somethings in our house also enjoyed the podcast immensely. Ready to get listening? Learn more on the Circle Round site and subscribe to Circle Round via iTunes, Stitcher or your favorite podcast app. Be sure to leave a review! This post is in partnership with Circle Round and The Mission List. All opinions are my own.